The jewelry arrived today and it's gorgeous! My compliments to David. All the best to you, and thanks for the unbelievably fast service (and the coupons - I'm sure I'll use them)! My I Ching has just arrived. Many thanks for your great service. Delivery was faster than expected and I love the item. Probably going to have to get a new chain as the rubber necklace seems quite feeble but the pendant is lovely. You will be hearing from me in the future I think. Health and happiness to you and David!
" Hello, and thank you. Just to advise that we received the mail yesterday, so, it's been quite long, but eventually, we got it! We like the two necklaces very much, and my daughter was very pleased to have it for her birthday. I have received my beautiful flower of life pendant, and I am very pleased with it!!!! Thank you so very much for the wonderful coupons, I will definitely share them with friends and family for their purchases in the future! Thank you for your email. I have recieved my pendant and I am delighted with the work. I hope that this pendant will help me in the harmony with the universe. Thank you very much,my pendant has arrived & I am very grateful for the replacement. The order arrived thankyou , the pieces are beautiful. I´ve just received the two pendants "Flower of Life". They are wonderful. I love them. My husband will be happy, for it is a present for both. Thank you very much. Please give David our thanks for his delicate dedication. We received the neckledge yesterday 2. marts. I'm writing to let you know that the jewels have arrived. I am very pleased by your creations. Thank you for your message. I have no specific date to give you. I received my order and I am very happy there. All my congratulations to David for fabulous sound work of artist. I recieve my order Today !!! It is even more beautiful than I expected , if that can be possible !!! Many thanks, please pass on my thanks to David, he is a true artist. I have received my necklace today. I want to thank you and David for the beautiful Items! I love it so much and hope soon to buy another one. It's really easier to send it to somebody in Israel and I arrange to get it from there, because the problems with the swiss border won't be resolved so soon. So I wish you both and your family peace and good vibrations of love. I really appreciate your quick shipping. These pendant heads are just amazing and beautiful. Surely my friends will like them. Please send regards to David for me. I will definitely come back and order some more. the rings are marvelous and size perfect. the next month,I buy a another because I love so much your jewelry. 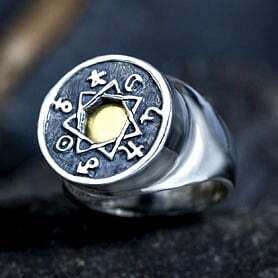 and craftsmanship of the 5 Metal Ring and Christ Consciousness pendant. Your attention to detail in your craftsmanship and customer service is commendable. I look forward to doing future business with you!! I've already taken from the customs the Key of Love pendant. It holds and emanates such a powerful vibration! So again, lots of gratitude to you David for your unoque way you express your love, mastery and wisdom to all of us. maintaining and amplifying the frequency of Love and Light within ourselves really makes a difference! Be blessed and may your wonderful and rewarding work make a difference in all the people's life who wear your cosmic jewels, and therefore, a difference in the world. I'm very happy that the Flower of Life arrived today! Much sooner than I expected. I received it in good order. It's beautiful, please thank David for this wonderful piece of jewelry. My jewelry arrived today - so quickly to Australia! - and of course I love all the pieces, they are so beautiful. I have been wearing the Genesa with crystal all day, it gives me a wonderful feeling of peace and I don't want to take it off... so I haven't even worn the other pieces yet as I prefer to feel the energies of each piece separately. Please pass my heartfelt thanks to David for making this jewelry - I will be back for more as soon as I can afford it. I just received my item. It looks great. Thanks for all the help and for the beautiful jewelry. I just wanted to let you know that I received the ring on Thursday Feb. 12. Thank you so much for fitting me in before Valentine's Day. The ring is beautiful and my husband LOVES it! Thanks again!
" Well guys, I have received my pendant/necklace. I have to say it's beautiful, the craftsmanship is first rate. I bought this piece to represent my comittment to the mystics path via Kabbalah and I have to say I am very pleased. Just to let you know we received our rings this week and they are beyond beautiful. They were made for our hands!!! Both fit perfectly, and we are so pleased. I was so impressed in fact, that I just made another order for your gorgeous Mother Earth pendant. What a splendid piece and for such an important cause! Ka gold jewelry's work is divine and so is the message each piece holds. Bless you all, and may your business be fruitful in the years to come. The Merkaba arrived yesterday and is truly beautiful. Many thanks to David for his creative skills and to you for keeping me informed of the progress. I hope to continue our relationship for many more years. i have received my order, thankyou. i would, once again, like to thank you and David for this very beautiful and unique jewellry. All of your jewellry is so special, it makes me feel happy when im wearing it. My best regards and thanks to David for making my ornament. I received both items today...they are absolutely gorgeous. I am so pleased. Please tell David that I love them. Actually I ordered more just a few minutes ago...I ordered another pendant and the same ring, only in a size 7... the last one fits but is a little snug for my finger so I am giving it to my daughter as she loved it too. Blessings I leave and a great thank you for everything. Thanks. Also, today I received my hamsa necklace and the ring that I ordered from you previously. They are both quite lovely. Thanks so much. We have today (12 Feb) received the refitted rings~they are very well done and it is third time lucky for us as now they fit perfectly! Thank you once again for David's craftsmanship and your help. I don't have a digital camera or scanner myself but I will hopefully find a friend who will be able to photo us wearing the rings and send it to you. we are more than happy with the beautiful pendants. very long time but i am fully satisfied in the end.All the Items as expected. David did a great work, i am very happy. I received your package with the nautilus and spiral pendants. They look gorgeous! Thank you so much! I wanted to let you know that your package has arrived, safe and sound. As usual it is a Very beautiful piece and I am totally thrilled with it. A HUGE thank you to you and David for the work you do and the fine craftsmanship of your beautiful jewelry! Many Blessings to all and Ka-Gold! Just wanted to follow up and let you know I received the piece yesterday. It looks great. Thank you!
" It arrived today. Thank you. It is the highest accessories!! " I have good receive the jewel (exactly wednesday the 5).
" I got it today (a day earlier than what the estimated time was!). I absolutely love it! Thanks a lot! " The gold Ana Becoach star for my wife arrived safely today and it is exquisite. Davis is a true artist and creates some of the most beautiful things I have ever seen! The pictures on the website just cannot do justice to such works of art. Thank you so much for meeting my tight deadline and getting it here with time to spare. The beauty of David’s work is only equaled by the phenomenal customer service you provide. Thank you I just received the rings and pendant. Everything fits perfectly and please tell the artist that the workmanship is beautiful.
" Thank you so much for offering to replace the pendant but it's not a big problem. It's very beautiful and I will get a photo to send you, only not sure when. Also, thank you for the discount coupons as I have been looking at other items, David has exceptional pieces to offer. We got it and it looks great! She is going to love it!
" I absolutely love my beautiful ring and I thank you so much. I recieved the ordered ring on 30th of january. I just received the ring today. It is most beautiful.
" My order made it here. It's very nice! Thank you for all of your help.
" I recieved both orders.I am delighted with the jewelry and will be ordering again in the future. My mother received the pendant yesterday. It arrived safely, and she thought it was wonderful! Thank you! they arrived just the right day. The package arrived yesterday - thanks a lot. The "Pattern of life ring" suits perfek (it was a gift for somebody in Israel). I am already back in Switzerland and couldn't take the "Tibetan Om ring Silver" with me (its a gift for somebody in Switzerland). I will come back to Israel at the beginning of March, and then I can take it with me home. I received my order today, Feb 2. Thanks, I know I will enjoy it for a long time to come.
" Received it today and I couldn't be happier. The ring is beautiful! Thank you, David. " We are very happy with the last delivery. David made two extraordinary beautiful pieces of cosmic art. Thank you very much! I finally recieved the package and I can say it was well worth the wait. I absolutely love the pendents, David does excellent work. I did not know he made he made these per order. I am sorry for being such a pain. I did need them on the 26th. I definately will order more, I love th Mercaba prana sphere in gold, but I need to save up to get one.
" Hello, I received my pendants and am delighted with them. Thank you for such beautiful work. " I received the Merkaba today. Please tell David that it has a life of it's own. He is awesome! David never rush your work...it would miss so much if you did. Since I received the Merkaba and have placed it on my person, which I have not removed since, my world has been turned upside down. This is not a bad thing. I felt as soon as I began wearing it that my crown chakra was opened by the Heavens and an influx of energy and wisdom was offered to me. Since that moment my life has not been the same. I have become incredibly more connected to everything and everyone around me. My abilities as an Empath have been magnified. I am grateful for this gift. The 'gifts' (clairvoyance, clairaudiance and the ability to channel) that I have been graced with have seem to be 'fine tuned'. My inner sight is clearer and I am able to hear the Heavens more readily. The messages that I have been receiving for those around me are clear an d accurate. I searched the meaning of the Merkaba and where this particular piece of jewelry was available. I was guided to David's work. Now I understand why. He is a channel for the Heavens. It is not simply a piece of jewelry that I wear. It is so much more. It is guidance, understanding and patience that the Merkaba has brought to me. Please do quote me. It is my wish that others should be blessed by David's talents. Thank you for such an awesome experience that I do not believe will end anytime soon. " It is gorgeous!!!! Thank you so much!!! 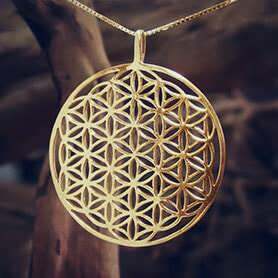 Yesterday the flower of life in gold arrived, its so beauty- and powerful, that I had to look at it for a long time and because I was so happy I put it next to my head when I went to sleep last night. This morning, when I woke up, my cat was sitting on it, on a place he normally never sits - even he was feeling the special energy coming from this flower of life. Thanks a lot to David. I have received my 5 Priestly Blessings Ring. It is beautiful and I can feel the energy within. Thank you for your kind assistance. With love & light, "
At last, my mother has your work of art hanging around her neck. I am once again grateful to you for your work, your help, your dedication and your enormous and beautiful spirit. Please, thank David and the team for their inspiration. From now on, I’m sure my mother will recover soon as Sarah and I are having a wonderful mutual understanding, like soul mates. Finally I want especially to thank your professionalism and affection. Many, many blessings to all of you. " I have received the PHI 18k pendant I ordered, and am very satisfied! It's beautifully made. Thanks for your service. You have a new well-satisfied customer. I received my order today. It is absolutely beautiful! Thank you very much :D "
the jewels arrived today. Let me tell you how Im happy with them! Make my compliments to David and send him my thankings. I recieved my package yesterday. The ring is very nice. Just what i was expecting. I need to place another oder for a friend very soon. What pendant would you recommend for protection againt black magic and evil spells? Please respond soon.
" Thank you so much for the beautiful merkaba, I am wearing it and love it. I will probably be ordering something again soon. " " Dear David, I just received my necklace and it’s absolutely beautiful! I’m giving it to my fiancé as symbol of my love and commitment; I couldn’t have made a better choice.
" I received my Flower of Life Pendant on time and my friend loved it. So did all the other friends who attended the birthday party. They all want one now! So do I! Thanks so much for your excellent product and service. " The package was delivered today - January 25 - exactly when we go to my friend's Birthday to whom the Tree of Life is meant, can you imagine this? :))) The pieces are magnificent and sophisticated. Lots of thanks to you and David. All the best wishes from "
today I received the pendant I ordered. I am very happy as it is so wonderful. I immediately adorned myself with it.
" This beautiful Flower of Life pendant arrived in my mailbox today. I love it! Thank you so much for sending it off so promptly and thank you to David and for the discount cards you included. It was a pleasure doing business with you.
" HOLA SR. DAVID YA LLEGARON LAS JOYAS A MI PAIS VENEZUELA SON PRECIOSAS Y TIENEN UNA MAGIA ESPIRITUAL GRACIAS POR EL ENVIO, SALUDOS. " I have received my pendant and it is stunning. We received your beautiful piece yesterday and we are so thrilled with it!! It was also received on Jan.22 which was my birthday at 11:01 am. I thought this was interesting as you had sent it out on Jan 19,2009 which translates to 11/11. So we have lots of ones happening! You will not believe what happened last night while wearing it...first at the restaurant the lights continually flickered on and off for the entire evening. I asked my husband what He thought was wrong with the lights at the restaurant and he said he didn't know. We arrived home and one hour later the main electrical transformer in our front yard which supplies power to the street blew out!! I am sure once it cleanses out and balances out the energy in this area it will settle out. I will keep you posted!! Many blessings and thank you so much, "
" Hello , I just Received the package. Everything looks very beautiful, thank you all for everything and be sure to thank David for me. I also really appreciate the customer service you guys have. I wanted to let you know that my pendant arrived today. Thank you so much! I absolutely love it! Warm blessing to you all! " I received your ring a few days ago. It lovely and I'm sure my daughter will enjoy it for years to come. Have received the pendants yesterday - great service and lovely jewellery. david and team ~ thank for adding me as a happy happy customer....I appreciate the repair and shine of my Tibetan Ring and the gem and ring look and feel of new again. Many blessings and thank you for going above and beyond "
" I received my order yesterday. Thank you so much. They are beautiful. I will be giving my sisters and mom your website to order.
" I purchased the Ring of Courage over a year ago, to help get through a lot going on in my life. Since then, I feel naked without it on, and must always know exactly where it is, it's become a part of me. I'm proud to wear it, and get asked about it all the time. Thank you so much for this wonderful new part of me. " I received it last saturday, Thanks!!!!! You make me very happy! Congratulations for your excelent work, they are beautiful!!! sorry for my English I would like to write and explain myself better! Have an excellent day! " I'm sure i'll have another order at your jewelry ! I have picked up my order at the post office today. The ring is wonderfull. S pozdravem / With Regards, "
" i received the beautiful necklace a couple weeks ago. it works! " " I've received the ring. It's very very beautiful. Thanks so much, David!!!!!!! " Today I received my pendant. With the weather it was held at the postal office here. First can I say that the way I found your site I have no idea but divine guidance. Second as I open the package I find the box itself beautiful with the piece actually stamped on the top then I stop to read the paper so to connect to the piece and I see another piece as well,,, a triangle with circle and 6 petal flower within attached to a nylon string.. I find interesting since the logo of my company contains all three of those shapes. The piece itself if so beautiful and I am so connected to all of it, thank you so much for the work you do. I look forward to other pieces and look forward to sharing with those that admire and ask about it. Can i just say the people at the post office were so enthused that the package was "All the way from Israel." I told them I ordered a piece of supreme creative force within and the creative force we all hold. the look was priceless. I love to do that to people ~~ it moves their minds. peace and blessings to you and the world "
I have received the special request piece. She (my wife) was thrilled, and I must admit that it even exceeded my expectations. Bravo! Excellent job. " " I received the jewelry!!! Tell David, thank you and I love his work!!!
" Grazie! GRAZIE Mr. Weitzman! The Torus knot arrived today. I truly love it! Its the most beautiful gift I've ever received. To know that you took time out of your busy schedule to make something just for me is truly mind boggling. I can't thank you enough, truly! I have received my Hamsa pendant and the chain. The pendant is marvelous. Also, thanks for the little package stuffer coupons, I'll be sure to use them. Thanks again. " I want to thank you and your (seen and unseen :-) helpers from Ka Gold Jewelry!! You're blessed with grace! Inspiring! 'missing" (why?) a ring around my finger right hand, a strange finger to wear a ring.. and I tried to forget my intuition and neglected it but those feelings are hard to resist :-). Then suddenly my eye fell on the I love therefore I am ring silvermoonstone, in the Happinez Holland, and I don't know what happend, but I knew that was the "missing" ring.. I don't why but from the moment it catches my eyes, after that strange feeling for months, that I had to put a ring on that 'strange' finger, it seemed to work on (sub)consious levels.. sorry words can't express the feelings of the spirit. So I ordered the small size for my finger but it was sold out for a long time, they replyed! They only had the size medium large left. I just could not believe it. For I was certain that it was the right THE ring for me.. that I needed it and not needed for material reasons but for the soul the growth. So I wrote again to happinez and said that I was so touched by the ring that I wanted to order the large size and that I was prepared to go to a local jewelry to make it smaller.. I also asked Happinez if there was a site behind the design. I only sensed what I sensed what the ring did to me even before ordering it. the symbols. That explained all to me. or gift.. it works straight to the heart. Happinez had told me that they would send the size M/L for it was the only size available.. I felt so sorry but said ok. But my goodness, yesterday I received the pacakage and opened it..
and it was the size STHE one sold out for a long time and my fitting size! I put the ring on my finger and it was as made for me.. fitted perfect. Ha haha hah of course all you're customers will tell you the same..but it's the truth. The moonstone is changing more and more into blue, my color..instead of white. I did send the Happinez immidiately a thank you email..for I was really pleased and surprised. And happy! Happiest! I wear it and won't take it of anymore. Cherish it with love and thank yous. ( Feels like it's connected with spirits) So just wanted to say thank you all behind the ring..you did a good job. I received the pendant today, again a wonderful creation. Please pass on my gratitude to David! I'm writing to let you know that I received the ring today. Its everything I hoped it would be and has such exceptionally beautiful craftwork. For a wanderer such as myself, the ring and the garnet will definitely have me feeling safe. This will be treasured for many years, to come.. All of you please take care, and I wish you all prosperity and peace in the future.
" Hello David! We received our package today and everything is great!
" Thanks. The item is just what I wanted … "
" Hi Yaron, Yesterday I received the package. Thanks a lot. Today my daughter is coming and I think she will like the ring. Thanks again so far.
" I did receive the ring a week ago. Its beautiful, thanks! Just wanted to let you know. Got the rings this past weekend, I'm very happy with them. Thanks! " I received it and it is perfect; I also like the gift of the healing/balancing pendant. I gladly received the pendant today! Thank you very much! I hope to be doing business with you again some day! J'ai reçu aujourd'hui ma commande ainsi qu'un très joli cadeau de votre part. Merci à vous. Just picked up my order from the post office. My friend will have them in time for her 50th birthday party--fabulous!! Thank you so much. I received my jewelry yesterday - thanks you so much - they are wonderful. " " I received my pendant today. It was all that I had hoped it would be. Please tell David thank you, and that I love it. " " Thank you all - And obviously thank you David. I have received the pendants and as I thought, I find them full of presence. These gifts will touch my nieces and their mother very much. I'm sure they will find comfort and protection from them. Again thank you for your kind mails and presence. I was very touched. I've received the ring this morning and it is beautiful! Thank you very much and blessings to you to! " " Ka Gold Jewelry is absolutely amazing! For our anniversary, I needed to find a mobius-shaped ring for my boyfriend Jimmy; this turned into quite the quest, as this shape is rarely crafted into jewelry. Ka had the exact thing for which I was looking, and it was delivered promptly. David's craftsmanship was impressive, and the product was even better than I expected! I was most impressed with Ka Gold, however, in their willingness to go above and beyond in their service. I unfortunately had to eyeball my boyfriend's ring size, and I greatly overestimated; The staff and David were not only willing to resize the ring for us, but they did so without any additional cost! The ring now fits perfectly, and it serves as my boyfriend's good luck charm, as well as the symbolic representation of our never-ending love. After months of wear, the ring is still in excellent shape, with only minimal signs of constant use. Thank you, David and all, for the excellent product and the impressive service! We will definitely turn to you for all of our spiritually- and symbolically-inspired jewelry needs! Jimmy's constant wearing of the mobius ring keeps reminding me of what a pleasant experience I had with you and David. " The pendant arrived today. Thank you, it is lovely. " Since same day I received the wonderful pendant and 2 rings: 5 metals & love, I have got special & unexpected blessings from God! I mean, real miracles!!! Thanks & million of blessings to David & you all! I hope God makes a miracle of love, compassion and understanding to bring peace to the whole area for ever!!! 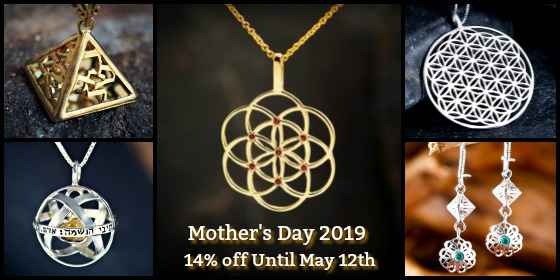 Lots of love & gratitude... "
" I just wanted to write to tell you that my girlfriend loved the flower of life pendant. She was really happy to see that I picked a business that took pride in the meaning of the symbol and their work. I too am glad that I chose your company as I think it does mean something to support people who love and take pride in what they produce. My girlfriend could not be happier and wanted me to thank you. I received the ring and I thank you, it very beautiful and very well done. Received the jewellery order today, and it looks fab please thank David for me. I hope the difficult times get easier for Israel as it seems such a beautiful place with beautiful people. The package already arrived. - The pendent is beautiful! " I received the abundance pendant today. I love it, It's perfect! Thank you so much. " I hope you are doing well. I just wanted to let you know that I received my jewelry two weeks ago! David, I received my gold Gordian knot, it is beautiful. Thank you for your meaningful and artistic work. You are a blessing! Just wanted to say a big thank you to you both for the beautiful pendant I received from you before Christmas as I forgot to let you know it had arrived, it was here in a mater of days! Ive already recommended you to my friends and hope to purchase from you again in the future.
" I received my order last week and wanted to let you know how much i loved this piece. Much larger then i expected! I am wearing it on a longer chain. Thank you again, I will be wearing the hamsa close to my heart. " Sorry it took so long to let you know I received my order and it is beautiful. I’m sure there will be more purchases in the future. I wanted to let you know that the talisman was received and my brother really likes it. He's wearing it daily and it appears to be clearing his energy already. Several people have stopped him and commented on the necklace as well has how he seems to be a bit calmer. Thanks for sharing the light! " thank you very much, these are splendid! I received the package today. Thank you very much. J'ai reçu aujourd'hui le dernier colis de ma commande. Tout m'est bien parvenu. Je vous en remercie. Les bijoux sont vraiment, vraiment magnifique, comme toujours... et dégagent une très belle énergie. I just received the jewellery, and it is perfect! Thank you all so much. " I have received the piece and could not be happier with it! Also, thanks for the bonus ornament. Great job with everything! I wanted to confirm that I received my pieces this past Tuesday and am very happy with them. Please thank David for me. They are beautiful! I received my orders a few days ago, I was just too busy and I forgot to write to you. But now I am writing to say "thank you" and to inform you that everything is OK with the order and the jewels are great, as always!-:) "
" Hello, Ka-Gold Jewelry. Just a note to inform you that my order has arrived safe and Beautifully Sound. Thank-you, and Blessings to you. We have indeed received the fruits of your amazing labors. Thank you so much for your artistry and timely response. With all that’s going on in your part of the world I’m sure you had more important things to think about. Thank you so much. Please have a happy, healthy, and above all, safe new year. " many thanks for prompt delivery. My order has been received on 22/12/2008. It was a gift for my wife at Christmas. The bracelet it was beautiful to behold. My wife liked this jewelry.
" Dear David: today I received your parcel with the three silver rings for my friend and myself. They fit us very well,and we are most satisfied with them. All your pieces are very original and we can boast of them because nobody here makes such jewels,due to the exclusivity of their design and work. We will be in contact again. Thank you very much and God bless you! " " Thank you! Thank you! The ant pendant is wonderful! I gave it to my neice for Christmas she hasn't received it yet but I know she'll adore it. " Just received my order today. Each piece is absolutely wonderful and beautiful. We received the ring on Friday 2 Jan. It is beautiful and my daughter loves it! Thank you so much. " " Thank you again for getting the nautilus here on time....she loves it "
" I received the order two days ago. I am very happy with it. I will be ordering from you guys again. Thank you. " " Please excuse my not writing sooner to thank you and David for the magnificent star. My wife was thrilled.with it. The jewelry was received ! just before Christmas. I received my order just in time for Christmas. Thank you very much. The result for both jewels is wonderful!!!! As usual, the job is done with professionalism. I wish you all the good for 2009. Blessings "
" David, Received my order. Everything is beautiful. I will be a return customer.
" I received it! In time, too! I am very pleased. Thank you so much. " I just wanted to let you know that I received my Gordian knot (silver, large) a few weeks ago on the very day that I had requested! Thank you very much for your help with keeping me posted about the order status. The necklace is beautiful and looks even better than on the website. This is my third purchase from you, and I'm sure there will be more in the future.
" We received the package Jan.3. Thank you, it is beautiful. it looks stunning! thank you so much! tell David that it was truely wonderful ^^ and thank you for being patient and keeping me updating in the ordering process ^^ "
" i wish you a healthy new year and shalom. today coming your ring and little gift. many thanks for the rings, he is so swell. many, many thanks and good luck! " I recieved my 5 metals ring on Jan. 2, 2009 what a great way the start New Year.! When the mailman gave me the package. I felt the sweet and loving presence of the White Light Of our Blessed and Divine Creator---the Light of --Love--I felt like It was my birthday!! I opened the package and I was in awe and excitement! I cried!! I was immediately guided--to put the ring on my left index finger. It fits perfectly. \" One with the Creator, we are contributing to a new world of peace and security\". I will buy all of my jewelry from you and I am going to tell all of my friends about you!! Thank you-- I honor you Happy 2009!! " " Today, Jan.3/09, I received all new Jewelry. Thank you again again and again for beautiful jewelry!!!!!! I love every jewelry David makes. You will hear form me soon :) "
" I received the necklace today and I love it. It looks great and David I very much appreciate it. Take care and I look forward to doing business with you all again. " I recieved the order at Christmas. Thank You ! It is a fine work! I received the lovely Key of Love pendant soon after your email. 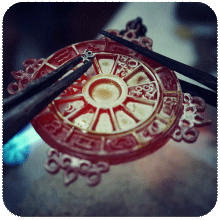 The pendant is beautiful and made very well. My daughter will love it.
" I received the order, thanks is beautiful, I really appreciated. " I recieved both the ring and the pendant on monday. thank you for bringing beauty into this world, "
" I have received it today just as I was heading out. I did not know it was coming from Israel. But thank you for your reply and thank you for your lovely work. I'm going to enjoy wearing them. with love and care "
Thank you for the beautiful Star of David. I received my order today, and it is gorgeous! David does amazing work, even more beautiful than the photos online. My brother will be thrilled with this ring! Thanks for such a beautiful piece of jewelry and such great customer service! " " So many thanks for the two beautiful rings received yesterday. I am quite certain that the two girls I am giving them to will be as pleased with them as I am. How wonderful to give people so much joy with your work! I received my pendant yesterday and I am thrilled. Please tell David that his work is a blessing to wear. May people take notice and come to Ka jewelry. I just picked up the order at the post office - thank you! It's perfect! Thank you for the beautiful flower of life pendant which I have today received and will wear knowing that my life and spiritual journey has ultimately through signs, symbols and life experiences led me to you. Since gaining universal and enlightening knowledge I was compelled to seek out the flower of life symbol. I searched our City all over asking if anyone had a pendant and no-one even knew what I was talking about so I would draw a picture of the symbol and they would say no we don't have it. I searched the internet and came across your website - finally I knew that this is what I was looking for. A sign - a oneness with our universe. I hope everyone asks me where I got it from so that I can spread the good news about your KA - cosmic jewellery. Blessings and Peace to you all. " The five metal ring arrived this morning in perfect state. Thank you very much. I am captured by its both strong and delicate beauty. The experience of its energy is something notorious and real. Please, give all my gratitude to Mr.David for the dedication put in this piece. Fortunate of knowing your work, "
" I have received the rings. They look great, Thanks. " Today I received my rings!! They are very beautiful and I can feel their warm energy very well! 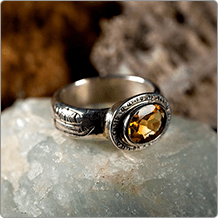 The cat's eye abundance ring is wonderful. I love the soft green colour of the gem and the form/shape of the ring! I'm really impressed by the jewelry you're making. It's very inspiring in many ways!
" Hello, I´m Alfonso, I´ve received my pack of jewels, I am very pleased and grateful. Thank you for all. " " Just to let you know that the pendant arrived yesterday. Thank you for your quick service. - And she loves it! " We received the ring today 29-05, thanks for the service. Have a happy one! " I received the order in todays mail. The Star of David is absolutely beautiful! It is even more delicate and lovely in real life than in your online catalog. Thank you so very much for your beautiful work. I will be ordering from you again. Thank you and shalom "
The parcel arrived safely. The artwork is once more very beautifull. I like the Genesa cristal very much, and my friend was thrilled with the key of realization. Once again thank you for making such beautyfull and meaningfull jewellery. I received my order. Thank you and David for a wonderful job. Thank you. With joy & peace, "
Thanks again for the beautiful Ring !!!! I love it as I love other jewelry from you.
" Thank you. I received the jewelry. It is very lovely. I am quite pleased with my order. I received my pendant, please tell David I said thank you and that he does fantastic work... Take care and bless you both... "
" I just received my order! Thank you! 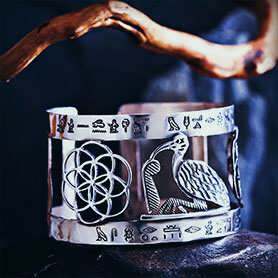 The pendants are beautiful and I love the scroll explaining alchemy and the symbol. Hello David. I received today the ring and it is fabulous. thank you again for your professionalism and for the beauty of your products. Blessings and thank you again. " " I apologize for not contacting you sooner regarding my receipt of the Ana Becoach Star of David. It is truly beautiful - it is not just a touching religous symbol but also a worldclass work of art. thank you. " I have just received your very nice "Tree of Life" pendant. Please remember me to David. I received my package. Thank you all and David for the order. I got them as gifts and they were very well received. surely return for holiday ideas. I did get my order and I was able to give it ON TIME thanks to your fast work!!!!! My husband signed for it and brought to me on my trip. I apologize, this is the first time I have been where I could send an email. I want to thank you for getting my order to me so quickly! Please tell David I am SO THRILLED over his beautiful work!!! I am already putting another order together!!!! Thank you and thank David for his incredible work. The pieces I ordered are just beautiful. The energy from these pieces certainly show the love and heart David puts into his work! Thank you and many blessings to you and David. " " Hello… I just received my order…. I am SO pleased! The jewelry and craftsmanship is beautiful. It’s everything I imagined and more. Please pass along my thanks to David for making my 5-metal ring. I expect I will be ordering from you again in the future!
" What wonderful craftmanship! I am in awe. So often you can only find a few pieces of Jewish jewelery, the standard items. The compliments I have received speak to your abilities. This has given me the opportunity to explain the meaning behind the pendants and the significance to our faith. I just received the 5 metals ring. It fits perfectly on my finger and looks and feels amazing. I'm so glad I found your company! Tell David thanks for staying up to make this ring, and all the other jewelry I've purchased. I'll be getting some more soon (I've my eye on some of the tsuba designs, as I love ancient Japan). j'ai bien reçu mon pendentif "key of succes". I have received the Merkaba... Thank you so much.
" Thank you, it arrived this morning and looks stunning. thanks again and it's in time for my workshop! " my merkaba wíth prana sphere has arrived. It's very beautifull. Thanks a million for the rings, they arrived last Wednesday, June 21st, they’re great! Also your personal creation is beautiful. It is for a very special friend, who has created a “way of thinking”, which has (coincidence???) exactly the same figures as your Personal Creation. Thanks for your service, we really like your collection also. If you ever want to open a shop or something in Holland, let us know, we will surely come by.
" I received the order. Thank you very much. They are wonderful.
" Thank you so much - I've received my order and just gorgeous! " " Thank you for all. Every jewel is beautifull, "
I have received the two gold flower of life yesterday. They are beautiful. Thank you for the great work. Yesterday I received my package for which I'm very happy. Thank you again !
" Hello from down under...Australia..I received today my booty of David's wonderful and inspiring jewellery..I have purchased before and cannot speak highly enough of David's craftsmanship...I am so grateful that I am able to have these pieces, and wearing them reinforces the faith and energy I embrace...my thanks extends to all who are involved in getting my purchases to me safe and super quick...I just love to read all the testimonials and the pictures some have emailed... especially love to see all your furry friends David, animals are a huge part of my life and love... I hope you will for many years to come, spread the love, and know you do make a difference...own your name David... thankyou and many blessings to all.... "
" The rings arrived today. They are most beautiful. They certainly have an energy about them and have obviously been made with love. I especially love the buddhi ring. Thank David for me. I am very glad (again)! The lovely Happines pendant arrived yesterday. It's great to wear it! The piece arrived and is beautiful (as I expected). Most importantly, my wife loves it! I just got my pendant and it's beautiful! Thank you and David so much for doing such a great job, both artistically and the wonderful communication! I've already recommended your website to friends and will let them know what a fantastic job you all did! Thanks again and all my best, "
J'ai bien reçu votre envoi. Le pendentif 'Merkaba' et 'Cristal Genesa' sont vraiment magnifiques et dégagent une énergie incroyable. Ils sont merveilleusement réalisés merci beaucoup. 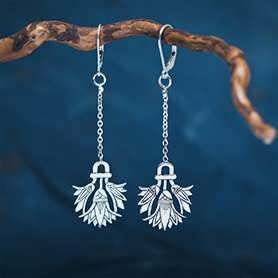 En ce qui concerne le pendentif de la 'fleure de vie' je vais le recevoir de mon amie pour mon anniversaire le 22 mai. Je ne l'ai pas encore vu... mais je suis vraiment impatient de le voir et de le porter. En ce qui concerne l'envoi, il faut que je vous informe d'une petite particularité en Suisse. Je vous remercie encore pour vos services.
" Hi! I already recieved the flower of life jewel. Thank you very much! it is really beautiful and well done!
" I received the pendant on Thursday and my wife was delighted. Shalom, "
" We got the rings! They are wonderful thank you so much!!! " My jewelry arrived today in perfect condition. I was so pleased when I opened the boxes and discovered that what I received is the same excellent quality as shown on your website. I also found that the scrolls that are included are very meaningful to me. I certainly will recommend your jewelry/gifts to my firends and others that I know.
" The jewelry has arrived and is very beautifull. Thanls!!! " " thank you so much for the beautiful ring i love it! bless you "
Today I received the ring of abundance. It is beautiful!! I just can't stop looking at it!
" I am so happy the pendants arrived. They look beautiful. People have asked about your work, and I will pass this information on to you. " " I received the order today....It's great......Really love it!!!! I'm sure I'll order again in the near future. received it today. I am delighted. They are absolutely lovely. The energy is palpable and they feel great when worn. I received my order. Thank you very much! " Got the two pieces this morning. I'm so excited to give them to the receivers! The dragon pendent is going to my step-son, who will be so excited to receive it! The other is going to my tarot study partner. They're both amazing! Tell David I said Thank you, and I look forward to getting the five metals ring next week! Gave the dragon gordian knot pendent to my 12 year old soon-to-be-stepson for his birthday this weekend. He loved it and hasn't taken it off yet! Looking forward to receiving the 5 metals ring. " the boxes they came in along with the little scrolls describing their significance. It was a pleasure doing business with you. Just to confirm safe receipt of the order on 13 May 2008. Thank you for your efficient handling of the order process. Please also send my thanks to David. The pendant is a beautiful, delicate piece of work. I am sure that I will be back in touch soon with further orders! Congratulations on Israel’s “birthday” celebrations.
" Hell David, I received the jewery very nice I enjoy them very much! Thank you. " I have received my package. I am late to let you know because I was not at home during my hollidays. I like the pendants very much. I just received my package. The ring is just beautiful. And the charm brings out feelings I don't understand. May you have all the blessings! " " The ring arrived today and is more beautiful than I had hoped for. Thank you so much. " " Thanks for changing my path. I received my ring and pendants and we are wearing them with pride- I could not wait to put them on and immediately I felt the rush of energy- my life has changed from sadness to happiness- I feel I am living and not just breathing. Thank u for the rush- I am so grateful u put a rush on them- and I do wish to repot all the happiness coming my way. thanks for protection. " The parcel arrived in Amsterdam on the 7th of May. Due to a strike of the post, it was finally delivered on the 10th. Just in time for my birthday! What a surprise. It is all so beautifully made, so refined. I am very happy with it all. The genesa pendant I will wear every day. I am curious about the effects! Thank you David for making the adjustments. All my friends are looking on your site now, they are impressed by your craftmanship and the energy of your design. I just received my Gordian Knot, and it is truly beautiful. David has a true gift, and your consideration and attention to the customer has truly made shopping online, not to mention shopping from another country a very pleasant experience. Hope you have great day and many blessings to you both for the future. " " Hello, the shipment has arrived and I love rings, Thanks! Thank you very much! " Just wanted to let you know that I did get the Merkaba this past Monday. It is beautiful and my fiancé loves it! Hello from Japan. Your package arrived here safely yesterday. The pendant is absolutely gorgeous! I will cherish it. work of art. If one steps back and looks at that pendant, it sums up not only the purpose of our existence but the path for attainment. It is profoundly unique in that aspect both personally and spiritually. Even though it is just a meaningless hunk of metal, it's value and attachment will be long lived. received it on wednesday, but picked it up today for it was at the post office. thank you... I love it. it is beautiful!! I received the order and it is gorgeous! I really like the antique look of it, and the way the frog and bamboo are raised up on it. These new pieces are definitely a great addition to your line of jewelry, and I'm wearing mine daily. thank you very very much for everything!!! For your great service and your excellent work!!!! The pendants arrived on monday. I'm very happy - THANK YOU with all my being power!
" Thanks, I receive it today ! !, I'll be watting by the new jewelry. Thank you for your product. It is very well done and I enjoy wearing it. Sincerely, "
This afternoon I’ve got both the jewels; they are beautiful! Thank you so much for your care and thank David for his masterly handwork ! All the best , "
I received my item yesterday and it looks great! Thanks again for another quality piece. Very pleased with David's work, and thank you for your prompt communication.
" For some reason I forgot that it was coming from Israel!! It arrived about three days ago. I love it. Thank you so much... "
" I have received the rings. They are beautiful and fit perfectly. We are very happy with our order. Thank you for your wonderful work. " I just received package 3 days ago. It looks very nice. Thank you and I really appreciate your work. I received the jewels today. Each one of them is a masterpiece, not to mention that I can feel the energy shining out of them. Most of my friends want the same now...-:), so be prepared to meet more orders. They catch the eye everywhere I go. Thanks and May the Force be with you. *** "
Just received my order - IT IS BEAUTIFULL !! Words can Not describe my thanks towards you all.. I can see the intense spiritual beauty of this ring. May Yah Bless you for your righteousness in the work you delivered! the goods came last saturday, very nice. Thank you very much. " The box had allready arrived and I like it very much and wear it every day. Thank you and to the next contact. " " She loves it. Thank you! " I love all of the jewelry I have ever purchased from you. It is really amazing. I would love to get the scarab and have wanted it for a long time, but it is too much for me... oh well. I will have to keep dreaming! Thank you and all the best "
My wife’s gift arrived yesterday and it’s even more beautiful than the picture led me to believe. David is truly an artist. Thanks so much for such gorgeous work and for such wonderful service! We have received the ring and the flower of life. Thank you very much! it s exactly what we wanted...your job is really great, the size are perfect...and the description wonderful. we feel blessed to know you.
" Just to let you know my happiness pendant gold 18k has arrived this afternoon. Please thank David for his continued creation of these wonderful detailed beautiful pieces of jewelry , I love the pendent. Blessings to you all "
" Im very happy. Thank you. BONITO DIA PARA TI. " Many thanks for the beautiful ring David made for me. It’s a real reminder this ring; his proportion fits the half of mine finger! But this is needed for me to remind me who I am. It fits comfortable and I am fond of this beautiful jewelry. Will you give David my compliments? I received the package yesterday. The jewelry is beautiful, thank you so much! My grandmother is thrilled. I look forward to doing business with you again. Take care. I have received my pendants. They’re very nice. Today I received the ring. So soon and beautifull. I received my order over the weekend and everythin was fine. I really love it! Please send David my warmest regards and appreciation. I thank you also in making my order effortless. Thanks so much again, "
I just received the lotus ring and it's absolutely perfect! I love it! David does amazing work.
" Many thanks for the beautiful piece of jewellery I am very grateful. Bright blessings. " I am happy that I could get it before my jurney. blessings to you , "
I have received my package last week I am pleased with the product. Thank you for helping me get it in time, your help was much appreciated! " I've got the package! Thanks so much! See you soon ;) "
A quick check in to say Thank you! We've received our Buddha-full rings, and enjoy them immeasureably. Elegant yet simple. Universal yet personal. in Love, with Gratitude "
I wanted to let you know that the ring and the pendant arrived yesterday! But I havn't opend it yet because they are a present for me and my partner. We have to wait until the 7th of may, I hope we can wait that long because we are very curious... Thank you very much for the quick service and David thank you that it was already possible making the Buddi ring for us. The package arrived on Wednesday - thank you so very much for helping it arrive in a timely manner. Please thank David as well. I received my Tibetan OM Big (The symbol of Consequence & Unity) and I can't tell you how grateful I am to David for such a beautiful piece and to you for your prompt communication! I have been looking for a symbol for a very long time and when I saw this piece it was just so perfect for me in so many ways! I want to thank you from the bottom of my heart.... I also appreciate the scroll and necklace (just perfect) not to mention your quick shipping. I will be a repeat customer without a doubt!!!! I'm wearing my ring and key immediately, and gave the longlive key on my mother (as she is suffering very much and almost 89 years old...so I hope by wearing this key she may stay for quite some years with us....if that's God's plan of course!). Many thanks and till a next time perhaps! I’ve just received my order, it’s amazing and unique !! Its simply wonderful……I’m so glad and grateful! Many thanks and blessing to you all!! " I received rings and pendant today. This is third time ordering jewelry from you and always amazed by your work. I love them all and so beautiful. We have received the items and my wife loves them. Thank you so much. " I just received my order, the Seed of Life pendant, and it is absolutely beautiful! Please tell David how pleased I am with it. I will be sure to order from you again. Thank you so much! " I received my order and I'm very happy. I'm sorry for my english, I'm not very good !!!
" Hello, and Blessings To You. Just a note to inform you that My Order Arrived and I'm Extremely Pleased. Thank-you so Much and I will be back to order from you again. Thank you, I got the jewelry . It is so powerful and nice! a few days ago I recieved the pendant and it is so very beatiful!! it makes me really happy. 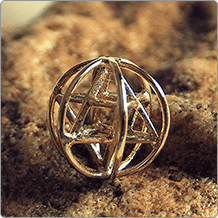 thanks a lot, "
I have just received the Merkaba that David made and it is wonderful! Let him know that I love it and thank you for the great customer service that was provided. I will be ordering again sometime soon. I'm very happy to tell you that I received my order yesterday, the piece is beautifull, the little box also, and the text explaining the symbolism very usefull. I'll be back to you to new orders and tell around me that you exist! today I received the jewels in good order, they are very nice! Just letting you know I received the package order today with all the items. They are all so beautiful like always, and the unique magic touch hand made technique always admiring that real natural beauty work. Thank you so much for everything again. Peace, love & good health!!! " I received the ring. It is more beautiful than I could have imagined!!! My daughter will Love it!!. Please thank David for me. You guys are wonderful!!
" received the pendant today. It is lovely, Thank you. " " Hi, I received the two rings today! They are so beautiful,and they fit perfectly- thank you so much ! " The ring arrived. Thank you. It is just what I hoped it would be. It’s beautifully designed and executed.
" Hello, I received the ring today and I am very happy with it. I didn't order the right size, it's too big, so I'm going to wear it around my neck and order a smaller size once I get the right size. Thank you. " I want to let you know that I received the package with the silver nautilus pendant. It is really a beauty! Thank you very much for sending it so quickly! It's great, thanks a lot! " " Arrived safely , beautiful work thank you. " " I got my ring and I LOVE IT! I received order safely this morning, the ring is great, I love it, and it feels like it belongs to me (it does now). Thank you very much.
" I received the Flower of Life piece today - you do beautiful work! G-d bless You and David. I´ll ordered to end of april once more! I have received yesterday the ring and the hung, which are really beautiful. My wife Sylvie loves them and I am sure they will help her to recover from her surgery. Best wishes, "
I received the pendant yesterday and it's beautiful! Thank you for your prompt and attentive service. I received David's wonderful creations yesterday, and wanted to THANK You again so very much! You guys are the BEST! Today I received my order. Thank you very much! I have received my order yesterday. I'm very enjoy of my ring. Nice stone,great work and very confortable.Thank you David and everyone. Blessings "
The Merkabas arrived today. They are truly beautiful. Thank you so much for your elegant craftsmanship. Peace "